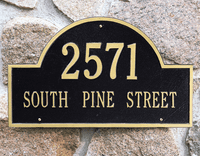 Home > Host & Hostess Gifts > Whitehall Personalized Plaques > Traditional Architectural Plaques > Architectural Arch Marker Estate- 23.25" x 14"
Architectural Arch Marker Estate- 23.25" x 14"
Estate Plaques are proportioned for larger homes and increased visibility across expansive yards. 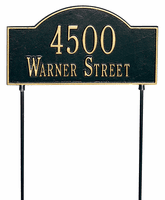 In addition to wall mount, this plaque also comes with a lawn mounting option - two 18" lawn stakes. One line holds up to five 4.5" characters or seventeen 2" characters. Font as shown without capital first letters.